The working principle of reducing cognitive load to enable more rapid consolidation of knowledge elements or increments can be re-applied in many collaborative learning scenarios. It can be done with a single individual where the exercises are designed to add new learning elements one at a time and thus reduce direct cognitive load and accumulated N squared cognitive loading. The Jigsaw approach to learning works well in a collaborative learning environment. Jigsawing allows learning in parallel. In effect the list of many different types of what might be called components of skills or sub-skills divided up and learned separately by different group members. Later these skills can be combined in a group task where each individual’s separate learning can be demonstrated ‘as a whole’ for others to see before attempting learning on their own. Clearly each person must eventually learn to do all or at least most of the essential skills to write programs on their own. However programming is not like learning to drive a car. Tasks can be divided up, each person can write independent code elements and then combine them in a group exercise. This could even be in online group shared document. It is easy to imagine two or three trainees in a multi-person audio online meeting combining what they have learned into a single composite code. 1. List of reading topics is divided, one topic each person, etc. 2. Explanation of each learning element is done by the responsible/capable individual. 3. Programming elements (function, syntax, etc.) as demonstrated in a working code can be explained separately by Jigsawed learners, each of whom focused on different items. 4. Difficult or problematic aspects of new programming elements can be explained by different RIs. Summary: Lists of learning elements for each exercise can be divided between responsible individuals in different ways. 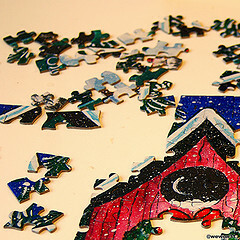 Jigsawing greatly reduces cognitive load. Depending on the element asynchronous meetings i.e. code consolidations might be possible.